Loved the fact that there was a spa bath in the bathroom and that the water pressure in the shower was fantastic!!! Great set up, with all the facilities we needed. Brilliant location too. Location central. Apartment excellent. Secure parking next to apartment. Great restaurant attached. My apartment & pool, staff were accommodating. The location of the room - Room 44 was terrific, on the third floor with views over the marina. Probably, the best view in Gero - no other hotel/restaurant could match it BUT watch out because a lot of the rooms are NOT overlooking the marina; some are not even by the marina, they are set back at the side of the car park. The apartment was light, spacious and comfortable. Location was excellent. Beautiful view over the harbour. Room was spacious and clean. The location is good and the room is big which suitable for the family as it have two bath rooms. The front desk staff was helpful as we arrived earlier than check in time, she called us the room was available when we went out for lunch. Excellent facilities, spacious and very good views. We had a harbour view new apartment, only by paying for an upgrade at 100AUD per night, but we thought it was worth it for the view, newness and fabulous facilities. 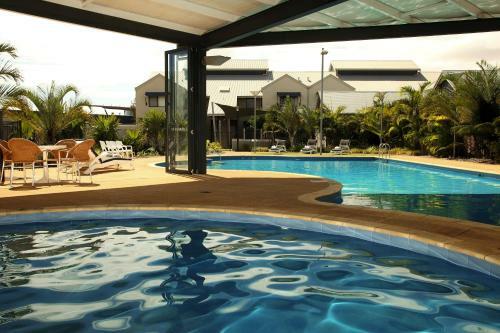 Lock in a great price for Mantra Geraldton - rated 8.7 by recent guests. 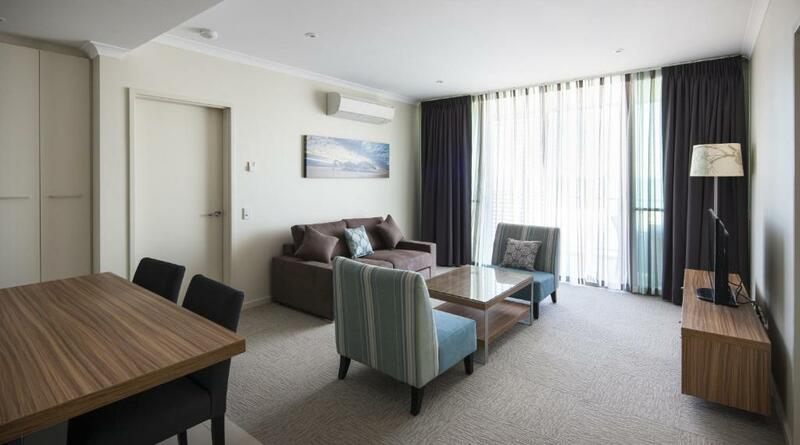 Situated on the Batavia Coast Marina, Mantra Geraldton offers apartments in two separate wings and features a heated outdoor pool, a spa pool, express check out and barbecue facilities. Complimentary parking is available. There are two separate wings at Mantra Geraldton. The One, Two and Three Bedroom Apartments situated within the East Wing offer self-contained accommodation with a full kitchen and laundry facilities, king beds, spa en suites and private balconies. The Northshore Complex offers two-bedroom apartments with city and harbour views, with the latter featuring breathtaking views over the water. Geraldton Mantra is a 2-minute walk from central Geraldton, where many shops, cafes and restaurants can be found. Geraldton Airport is a 15-minute drive away. 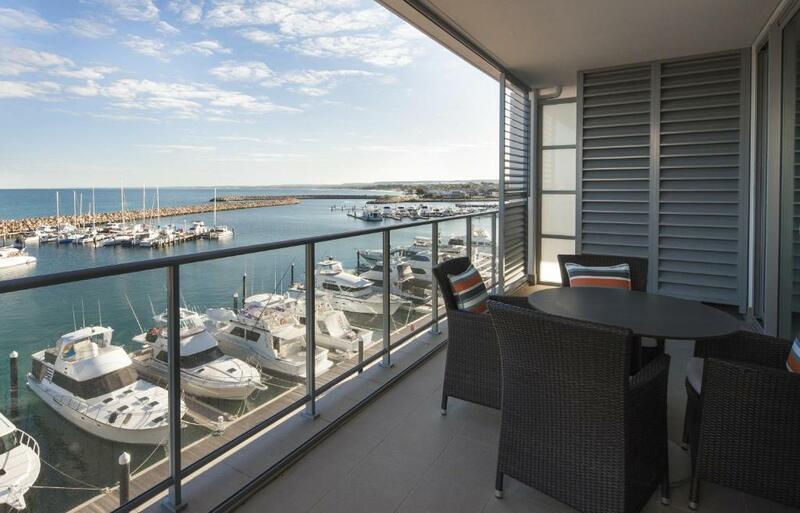 This property also has one of the best-rated locations in Geraldton! Guests are happier about it compared to other properties in the area. 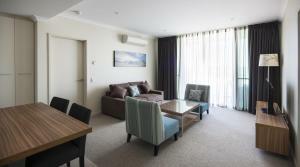 Mantra Geraldton has been welcoming Booking.com guests since 30 Nov 2012. When would you like to stay at Mantra Geraldton? This spacious apartment features bright, modern decor and offers a fully equipped kitchen, a balcony and a hot tub. It has a lounge and dining area and a TV with cable channels. This spacious apartment features a balcony or a terrace and a hot tub. It has a fully equipped kitchen, 2 bathrooms and a dining area. The lounge area has a TV with cable channels and there is also laundry facilities. This apartment has 2 bathrooms, a fully equipped kitchen and a dining area. This apartment features modern decor, 2 bathrooms and a separate lounge and dining area. This apartment features a private balcony with views of Champion Bay. It offers modern decor, 2 bathrooms and separate kitchen, dining and lounge areas. WiFi is available in the hotel rooms and costs AUD 25 per 24 hours. House rules Mantra Geraldton takes special requests - add in the next step! A damage deposit of AUD100 is required upon arrival, which is about GBP54.82. This deposit is fully refundable 14 days after check-out as long as there has been no damage to the property. Mantra Geraldton accepts these cards and reserves the right to temporarily hold an amount prior to arrival. A damage deposit of AUD 100 is required on arrival. That's about 54.82GBP. This will be collected by credit card. You should be reimbursed within 14 days of check-out. Your deposit will be refunded in full via credit card, subject to an inspection of the property. We were in a downstairs unit and could hear the children running around upstairs, but it was not a significant issue for us. The kitchen equipment is enough for cooking but not sufficient as other AIRBNB house. The stink smell in the apartment due to the dishwasher.